Mrs. Beaver: Hush, Mr. Beaver! The kids are smart enough to have figured that out on their own. And they don’t know the author as “Jack”–they know him as C. S. Lewis. You’re confusing them! Sonja: Well, I’ll bite–Mr. Beaver, why do you say that Jesus isn’t safe, but good? Mrs. Beaver: Mr. Beaver, you’ll be giving the children nightmares! Mr. Beaver: And rightly so, a very dark night that was, to be sure! [He drank some tea and shuddered, as it had gotten quite cold] But think! 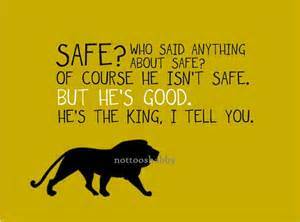 The whole Jesus–not just the bleeding and dying man hanging from a cross–the whole Jesus is, like Aslan, an awesome sight to behold! Think for a moment on this: John 1:1-3 tells us that Jesus was at the beginning of everything, that he’s God, and “through him all things were made.” You, me, every reader out there, and all the wonderful and terrible things in nature–everything. [Mrs. Beaver refilled his tea] Mr. Beaver: Oh, thank you, my dear. Where were we? Oh yes, Jesus. Psalm 99:4 calls God the King–someone mighty, and a lover of justice. Someone who makes the nations tremble, like it says in 99:1. Jesus is God, right? Fearsome! Sonja: But, Mr. Beaver, isn’t justice a good thing? Why be afraid of it? Mr. Beaver [leaning in and whispering]: What if you received “justice” for every bad thing you ever thought or did, and Jesus was the one handing out the punishments? Sonja [her teacup rattling nervously]: Yes, I’m starting to understand! Not safe! but through his death and resurrection, Jesus shows us just how good he really is. Mr. and Mrs. Beaver in unison: Rightly so! Sonja: Thank you, Mr. and Mrs. Beaver, for joining me here today! One last thing. If you see Reepicheep, can you tell him how very much Timley Mouse in Sophie’s Quest admires him? They both carry swords, you see, and both have been injured in the line of duty to a friend. Mr. Beaver: Will do, will do! I hope you enjoyed our interview! Next up: Balaam’s Donkey, from the Old Testament. Apparently, God thought an animal had something important to say, too! This entry was posted in Bible Stories, Faith and tagged Aslan, interviews with talking animals, Mr. Beaver and Mrs. Beaver, Narnia. Bookmark the permalink. I’m really enjoying these interviews. 🙂 Nice job Sonja! What a fun idea, Sonja! Makes me want to read the Narnia books all over again. And I do hope that Timley and Reepicheep can meet here on your blog some day.